A short story of depression, friends, and crushes. Samantha Fiddler has been depressed for the better part of the last two years of highschool. She's barely scraping by, and nothing makes sense. She wants to go home and sleep. She feels guilty about everything... but for the time being she just needs to hold it together while hanging outside with her best friends. 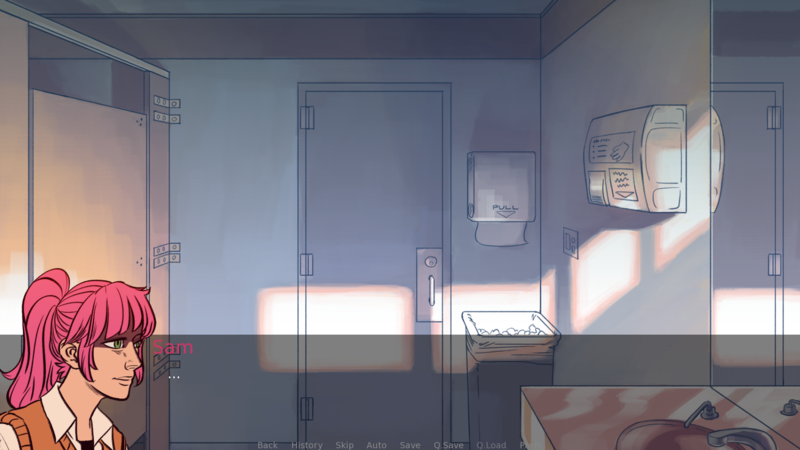 This game was made as a submission for Yuri Game Jam 2017. The current build is still needs custom GUI, replacement backgrounds, and fine polishing, but is otherwise fully playable, complete with character art and music! 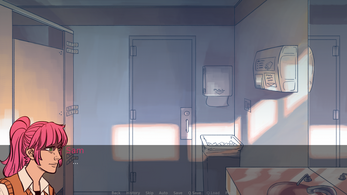 If you find any bugs or grammar/spelling mistakes, please leave it in the comments or the devlog on the Yuri Game Jam! Aw, thank you! I'm so glad you enjoyed it and related with Sam so much. I'll definitely be considering a larger, expanded story for the eventual version 1.0 release. Hi. This game is great. I really love it. Very nice plot. I really like how game is based on choices that player makes. And I really like how different are endings. And I'd like to ask you two questions: Is Hallie only datable character or maybe we can confess Katey too? How to get "Chicken-out confession"? It's the only ending I haven't done. I feel like I tried everything and I've red tutorial you posted below but I still can't get it. Hi!! Thank you so much :) I'm glad you've enjoyed it so much! 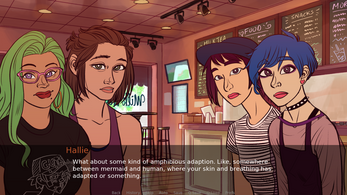 Yes, Hallie is the only "datable" npc, I didn't write anything for Katey; that might change in a future update with how many people seem to really want to see that. So in-game its actually called the Bail Ending. 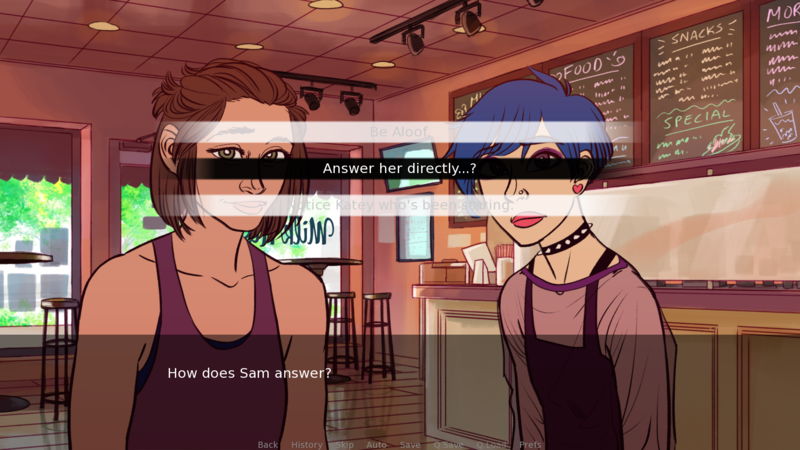 You get it by first "confessing" in her dream, then rejecting the offer for Hallie to replenish Sam's drink, and also triggering a flag at one of two places (and if you triggered it before, you can potentially undo it at the second juncture): Select "Answer her directly...?" triggers the flag, and "Its nothing special. Katey's mom can do it better." You can select any other option before, but you need to select "Its nothing special," otherwise "Its nothing, but yeah, I can do that." undoes the flag. 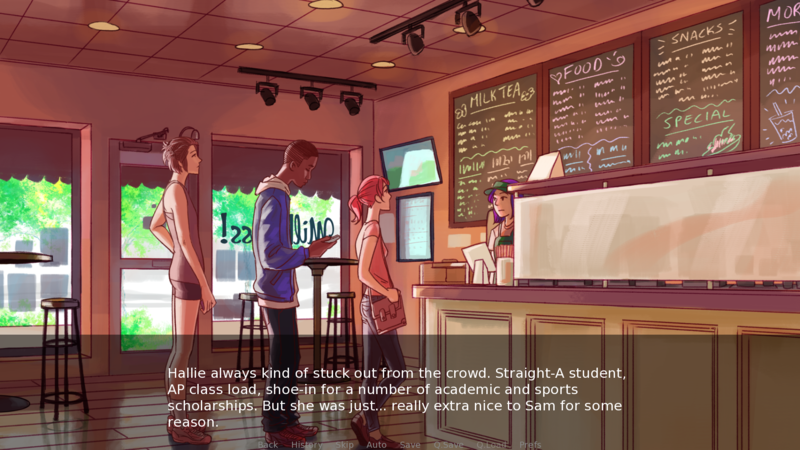 You'll be given the option to "Confess," but Sam winds up not doing so. Also, I literally just found a programming mistake that doesn't put the correct Katey sprite for the last line of dialogue... so before you go and follow my instructions for that last ending, let me go fix this and upload a new update, haha. Version 0.93 should have the fix in the next half hour. Hey, I love your game! It's very well made and intriguing. 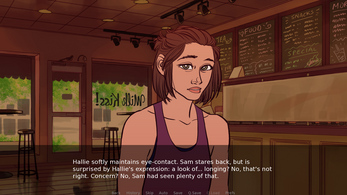 I've been trying to get all of the endings and i'm stuck on the confession ending but with the great dialog I can play this over and over :) Well done! 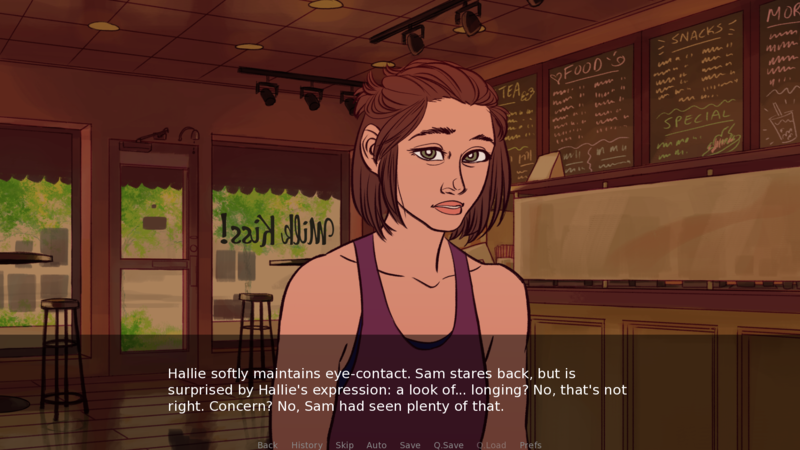 The Confession endings require that you say no to Hallie's offer for another drink, but the true confession requires that you also have the dream sequence by "confessing" at the beginning of the story. This is followed by choosing more optimistic and voluntary choices throughout the rest of the game for both confession endings to reach them. The Restroom endings require that you accept Hallie's offer for another drink and stay positive through the rest of the story, which will lead you to the restroom. There you are given the choice of either awkwardly pushing Hallie away by telling her you need to use the restroom, or tell her that you appreciate her. The Neutral ending is easy to achieve by being occasionally negative and not accepting the drink, but sticking it out to the end. 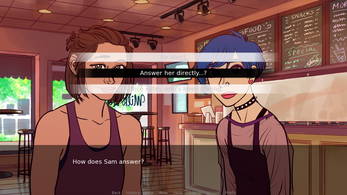 The Bad ending requires you to trigger a depression flag either at the beginning ("I'm just a depressed idiot"), or in the middle ("No, Katey's mom can make it better"), and then proceed to leave the cafe when Hallie gets up to use the restroom instead of sticking it out. 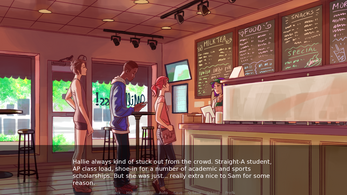 Everything else is largely flavor text in terms of dialogue choices, so feel free to explore and try playing the game with different mindsets of how Sam feels and wants to approach the world. is the first restroom ending the intimate ending? cuz that's what i got in my first play through. i love this game sm!!! I saw your post in the Dev Log Forum, and I decided to give it a shot. Beautiful. The art was really fun, the backgrounds we're well done and the music choice was, flowing. Personally I really liked it, I've never been one for Visual Novels, or Yuri ( I hadn't heard of that until recently) but the art style was enticing - but what really drew me in was you mentioning depression in the game's description - so that made me give it a shot - and I didn't regret it - warm, yet depressing, and with some good laughs in their too. The description of depression at the start was striking well done, even though it can be overwhelming to mention so much - it's the brutal reality of the affliction, and I wouldn't count that against the game in any way. 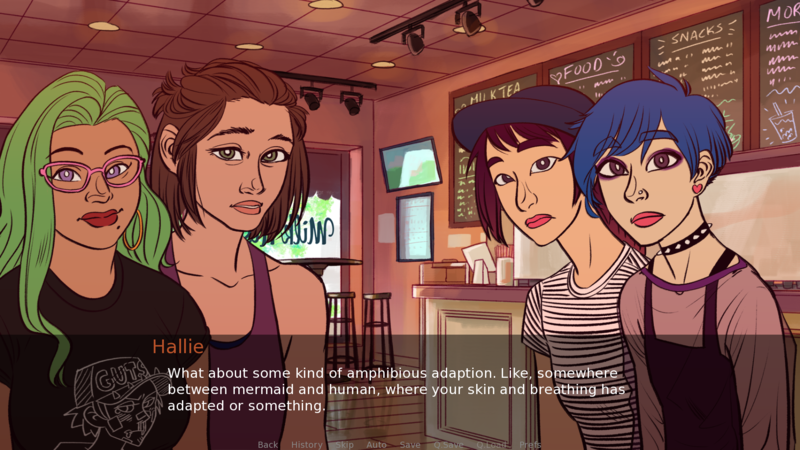 The vibe did remind of Life is Strange, but had it's own unique personality which is good - aesthetically it seemed like it was it's own thing, and reading about how you worked on the project before Life is Strange was released is heart-warming. Being compared to a big project like that can be insanity driving. Considering the time constraints - you did a really good job. The writing is sharp, and everything seems to be working well. I wish you well on further endeavors for this project, as I can tell a lot of love went into it. Also even though this is a terrible bias but - the Miyazaki reference was a nice touch. I love Howl's moving castle. So bonus taco's there. Hi Mark! Thank you so much for your kind words <3 Which devlog forum? I think I posted it around in a few places. To clarify since I can't think of which post you're referring to, I had begun working on my webcomic, Time Fiddler, before Life is Strange's announcement trailer, and not this game, lol. 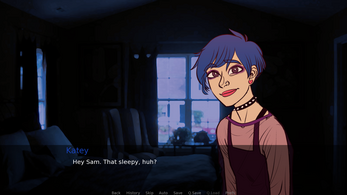 I wouldn't say it was super insanity driving but more a surprise that someone was almost making something similar to me (as far as teen girls with time travelling abilities with some drama and romance is concerned), and quite honestly waiting until the season was done (and more importantly I had completed a large chunk of my comic) before playing it was super rewarding because it honestly felt like someone had gone into the deepest parts of my brain and made the thing I wanted without me putting in the effort; like it had been made just for me. So I loved it, honestly. It helped that I had fleshed out my story a good amount before consuming theirs so that I had a clear direction and goal with mine that was unaffected by their art :P (at least not too much). The more of that type of thoughtful content and pacing we have the better. Time Fiddler was born out of a perceived lack of it on my end, whether that's true or not. I'm glad to hear that you liked the writing. That's the one thing I have zero point of reference to for whether or not its good. I still feel like its clunky in places and constantly tweak it when I go through it. Ah, very interesting to hear your thoughts. And my bad I meant to say I saw your post for the game in the release announcements forms. And I agree - thoughtful content is truly the best, and its's encouraging to see someone make something out of a desire to see it for themselves. Writing's weird. You can be easy to under or over estimate quality as you cannot read it as a reader, only a writer. To me the writing works overall pretty well, the thing about natural writings - is that it is almost unnoticeable - nothing seemed glaringly clunky to me, I guess the only way to reflect is give it time to rest and review later on. Hmm. And you're welcome! I thoroughly enjoyed. Wish you well on future projects.